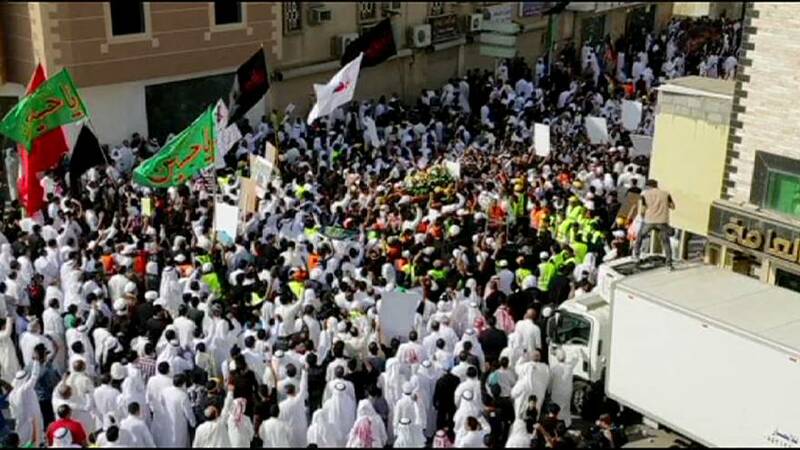 Thousands of Shi’ite Muslims in Saudi Arabia turned out on Saturday for the funeral of the latest victim of the country’s deadliest bomb attack in years. Mansour Fateel died from his wounds sustained in the previous day’s suicide bombing at a mosque in the village of al-Qudeeh. His death took the number of victims to 22. The attack was one of two on Friday which the Sunni Islamic State group said it carried out. The second, at a Shi’ite mosque in nearby Dammam killed four people, according to the authorities. ISIL’s suicide bomber targeted worshippers at Friday prayers, but Saudi officials said he had failed to reach the mosque itself. Most of Friday’s victims – all men and boys – are buried in a cemetery next to the mosque, each grave marked with a photo. Mourners condemned sectarianism, several blaming TV channels for portraying Shi’ites as heretics. “The biggest reasons behind this (the suicide bomb attacks) are the sectarian TV channels and they are making Shi’ites into infidels in the school curricula,” said Zakariya Abdullah al-Daoud, a visitor to the al-Qudeeh mosque. “Twenty-four hours (a day) they say Shi’ites are infidels, Shi’ites they don’t worship God, Shi’ites they don’t have the Koran, Shiites they have another Koran, Shiites they are worshiping the graves, and more and more and more,” he added. The US-based SITE monitoring centre says ISIL’s Saudi branch has released a new recording declaring war on Shi’ites, urging followers to “kill enemies of Islam, especially Shi’ites”. A second attack claimed by ISIL on Friday at a Shi’ite mosque in nearby Dammam killed four people, according to the authorities. ISIL’s suicide bomber targeted worshippers at Friday prayers, but Saudi officials said he’d failed to reach the mosque itself. Both attacks took place in the kingdom’s oil-rich east, home to a sizeable Shi’ite minority. Saudi Arabia has strongly denounced the attacks. King Salman has vowed to bring those involved or sympathisers of the acts to justice.